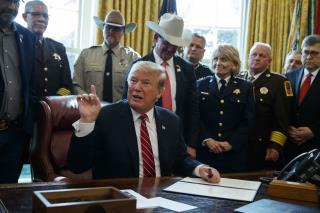 (Newser) – President Trump on Friday said he doesn't think that white nationalism is a rising global threat. "I don't really," said Trump when asked about the issue in the wake of the New Zealand massacre at two mosques, per USA Today. "I think it’s a small group of people that have very, very serious problems," he said. "It’s certainly a terrible thing.” Trump also said he had not seen a purported manifesto from one of the alleged attackers that is said to mention him, reports the Washington Post. A story at NBC News quotes the document as referring to Trump as "a symbol of renewed white identity and common purpose" while faulting him "as a policy maker and leader." Far more violence on the rise on the far left. tune in to 'christian broadcasting' some time for the latest hate speech!